Granite City Food & Brewery has the best craft beer in Schaumburg. Our unique and patented brewing process called Fermentus Interruptus, is what gives our craft beer in Schaumburg its distinct flavor. Our craft beer in Schaumburg is made on-site. Granite City Food & Brewery produces all the yeast used to ferment our artisan Ales and Lagers. If you are looking for a delicious craft beer in Schaumburg, then come visit Granite City Food & Brewery, you will not be disappointed. If you have any questions, comments, or would like to reserve a table, feel free to give us a call at 630-523-5700 or fill out the form to the right and a representative will respond shortly. 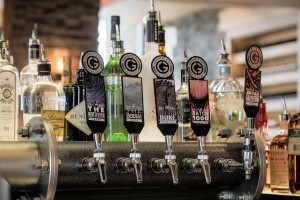 Granite City Food & Brewery brew all our craft beer in Schaumburg on-site, so you know you are getting a fresh, cold brew that is delicious and full of flavor. Our craft beer in Schaumburg is made from only the finest, freshest ingredients to have a consistently refreshing brew. The craft beer in Schaumburg Granite City Food & Brewery is made with hops from the Pacific Northwest of the United States and England, and the barley for our craft beer in Schaumburg comes from Germany, England and the upper Midwest United States. Come visit Granite City Food & Brewery and enjoy a cold, refreshing craft beer in Schaumburg today. If you are looking for a unique and never plain craft beer in Schaumburg, then Granite City Food & Brewery is the best place to be. There is also fantastic menu items to go with your craft beer in Schaumburg, try our popular bison burger. If you have any questions, comments or would like to reserve a table, feel free to fill out the form to the right and an associate will respond shortly or give us a call at 630-523-5700.